Chalet La Moraine is a stunning and contemporary luxury self catering chalet, perfectly located for your ski or summer holiday in Chamonix. Ideal for special occasions, skiing or relaxing, self catering or dining out. 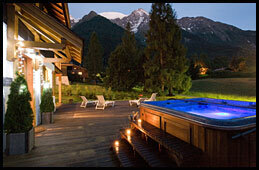 At the foot of Mont Blanc you will find this wonderful ski chalet, sleeping 10 in a beautiful and tranquil location. Completely renovated, the traditional exterior hides a contemporary designed, chic interior with top of the range facilities. Chamonix is world renowned for its winter skiing and summer sports, so whether you want an activity holiday or just to relax and take in the breathtaking views, there is no better place to stay. All bookings, payments & queries are handled by the owners, Richard & Sarah. Trip Advisor rates the Chalet as Excellent with ten 5/5 reviews. Homeaway, the UK's number 1 holiday rental site, has rated us as one of their top 10 ski chalets in Chamonix. 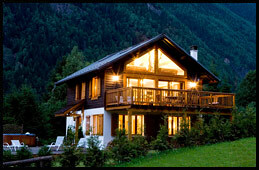 The Observer recommends Chalet La Moraine as best privately rented chalet, calling it "a stunning property in the Chamonix valley"
Chalet La Moraine is perfect for ski or summer self catering holidays. It is fully equipped with luxurious fittings and facilities. It is situated at the foot of Mont Blanc and sleeps 10 guests in 5 bedrooms which can be configured entirely to requirements as either superking doubles or twins. 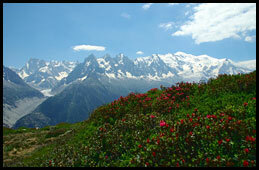 The majestic Mont Blanc at 4,810 metres is the backdrop of the spectacular scenery of the Valley. Chamonix is a popular winter skiing, snowboarding and summer holiday destination, but is well worth a visit all year round. 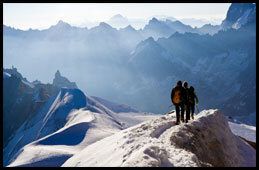 It is often described as the home of Mountaineering with the first ascent of Mont Blanc in 1786. Chamonix is synonymous with world class skiing & snowboarding, especially off-piste, however, there is something for everyone, including non-skiers. There are several different ski areas in the valley. Les Houches is good for intermediates, has a good ski school for beginners (there are 4 green runs) and is also a good choice when the weather is bad. This is a fantastic summer holiday destination and is just as popular in the summer as the winter, with people coming to enjoy the hiking, mountain biking, paragliding and the climbing or just to take in the breathtaking views. The Aiguille du Midi cable car which has amazing views across to Mont Blanc is the 2nd most popular tourist attraction in France. Chamonix has something for all the family, young or old. In winter, for children this can often centre around ski school and there are some excellent ski schools in the valley but there are also other activities such as husky rides which can be great fun for kids. For a day off skiing or for non-skiers there are plenty of alternatives in the area. 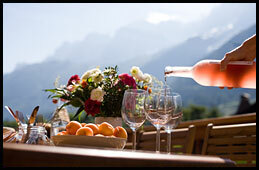 Chalet La Moraine is designed to be totally flexible for all your self catering requirements. The designer kitchen was designed with self catering holidays very much in mind. There's plenty of crockery, cutlery, glassware, pots and pans and all the utensils you will need for your self catering holidays. Chalet La Moraine is set in a beautiful and tranquil location, with stunning views to Mont Blanc and the surrounding massif, including the Aiguille du Midi. 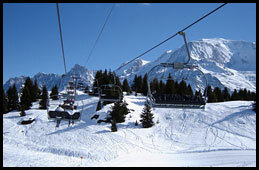 It is located in Taconnaz, at the foot of Mont Blanc and is perfectly situated to explore the stunning valley. Taconnaz, unlike Chamonix town centre has not become built up, and the chalet has plenty of outdoor space with a large garden and deck with a hot tub as well as parking for several cars. 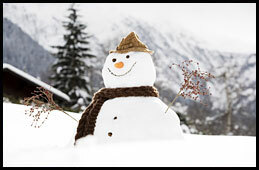 Chamonix is such a special place that it is perfect for family celebrations and special occasions. 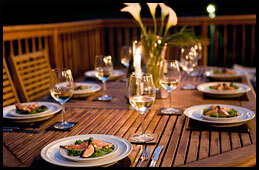 The chalet has seen Birthdays, Anniversaries and also Wedding parties and Celebrations. It sleeps 10 in 5 bedrooms and is family friendly. If you are celebrating a special occasion as part of your holiday and are interested in activities for the family or hiring a chef for the evening or anything else, please contact us as we would be delighted to discuss this with you. We do not use any agents. You deal directly with the owners. We take your bookings and payments directly. We can take payments by credit card or via bank transfer. We only use a few trusted direct sites (we can tell you all the sites). If you are in any doubt, please contact us directly. You will get through to Sarah or Richard and we own the chalet. We're also an affiliate of the Ski Club of Great Britain.